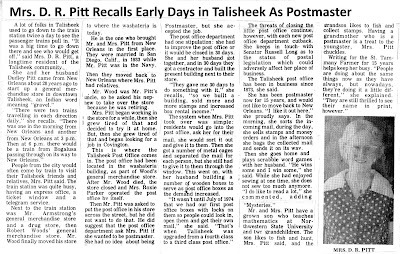 Mrs. D. R. Pitt of Talisheek worked in the store there for many years and also served as the area's postmaster. Below is an article that gives her perspective about how Talisheek grew through the years. A lot of folks in Talisheek used to go down to the train station twice a day to see the passenger trains pull in. "It was a big time to go down there and see who would get off," said Mrs. D. R. Pitt, a longtime resident of the Talisheek community. She and her husband Dudley Pitt came from New Orleans about 28 years ago to start up a general merchandise store in downtown Talisheek, an Indian word meaning "gravel." "There were two trains traveling in each direction daily," she recalls. "There was one in the morning from New Orleans and another from New Orleans at 3 p.m. Then at 6 p.m. there would be a train from Bogalusa passing through on its way to New Orleans." People from the city would often come by train to visit their Talisheek friends and relatives, Mrs. Pitt said. The train station was quite busy, having an express office, a ticket window and a telegram service. Next to the train station was Mr. Armstrong's general merchandise store and a drug store, then Robert Woods' general merchandise store. Mr. Wood finally moved his store to where the washateria is today. He is the one who brought Mr. and Mrs. Pitt from New Orleans in the first place. They were married in San Diego, Calif., in 1933 while Mr. Pitt was in the Navy. Then they moved back to New Orleans where Mrs. Pitt had relatives. Mr. Wood was Mr. Pitt's uncle, so he asked his nephew to take over the store because he was retiring. Mrs. Pitt began working in i the store for a while, then she I grew tired of that and decided to try it at home. But, then she grew tired of that and began looking for a job in Covington.This is where the Talisheek Post Office comes in. The post office had been located in the washateria building, as part of Wood's general merchandise store. After Mr. Wood died, the store closed and Mrs. Roxie Parker operated the post office by itself. Then Mr. Pitt was asked to put the post office in his store across the street, but he did not want to do that. He did suggest that the post office department ask Mrs. Pitt if she wanted to be postmaster. She had no idea about being Postmaster, but she accepted the job. The post office department had one stipulation: she had to improve the post office or it would be closed in 30 days. She and her husband got together, and in 30 days they got a contractor and built the present building next to their store. "They gave me 30 days to do something with it," she recalls, "so we built a building, sold more and more stamps and increased box rental income." The system when Mrs. Pitt took over was simple: residents would go into the post office, ask her for their mail, she would sort it out and give it to them. Then she got a number of metal cages and separated the mail for each person, but she still had to give it to them through the window. This went on, with her husband building a number of wooden boxes to serve as post office boxes as the demand increased. "It wasn't until July of 1974 that we had our first post office boxes with locks on them so people could look in, open them and get their own mail," she said. "That's when Talisheek was upgraded from a fourth class to a third class post office." The threats of closing the little post office continue, however, with each new post office department cutback. She keeps in touch- with Senator Russell Long as to the status of postal legislation which could adversely affect her place of business. The Talisheek post office has been in business since 1873, she said. She has been postmaster now for 15 years, and would not like to move back to New Orleans. "I like it out here," she proudly says. In the morning, she sorts the in­coming mail, during the day, she sells stamps and money orders and in the afternoon she bags the collected mail and sends it on its way. Then she goes home and plays scrabble word games with her husband. "He wins some and I win some," she said. While she had enjoyed ' sewing at one time, she does not sew too much anymore. "I do like to read a lot," she commented, adding "Mysteries." Mr. and Mrs. Pitt have a grown son who teaches mathematics at Northwestern State University and two grandchildren. The son likes to fish and hunt, Mrs. Pitt said, and the grandson likes to fish and collect stamps. Having a grandmother who is a postmaster is a treat to the youngster, Mrs. Pitt chuckles. Writing for the St. Tammany Farmer for 15 years helps keep her busy. "People are doing about the same things now as they have always, but nowadays, they're doing it a little different," she explained. "They are still thrilled to see their name in print, however." Talisheek is a small crossroads community at the eastern end of La. Hwy. 435 where it intersects La. Hwy. 41. To get there, you go to Abita Springs and then head for Money Hill's original entrance on Hwy. 435. Talisheek was on the railroad track between Slidell and Bogalusa before the track was abandoned.